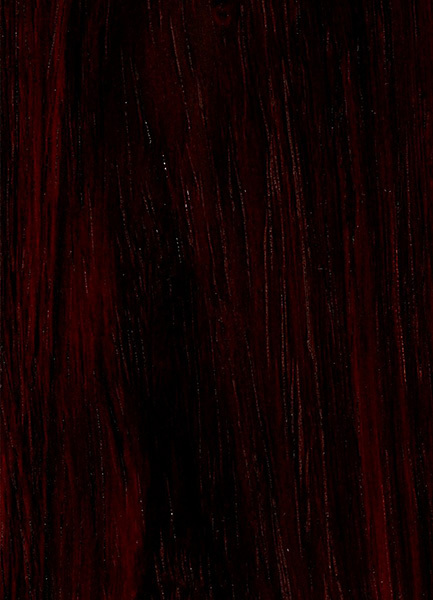 Color/Appearance: Heartwood color is a vibrant magenta or reddish purple, sometimes with darker violet-black streaks. Overall color tends to darken with age to a deep purple to nearly black. 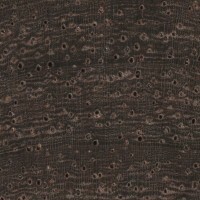 Grain/Texture: Has a fine uniform texture with a very high natural luster. 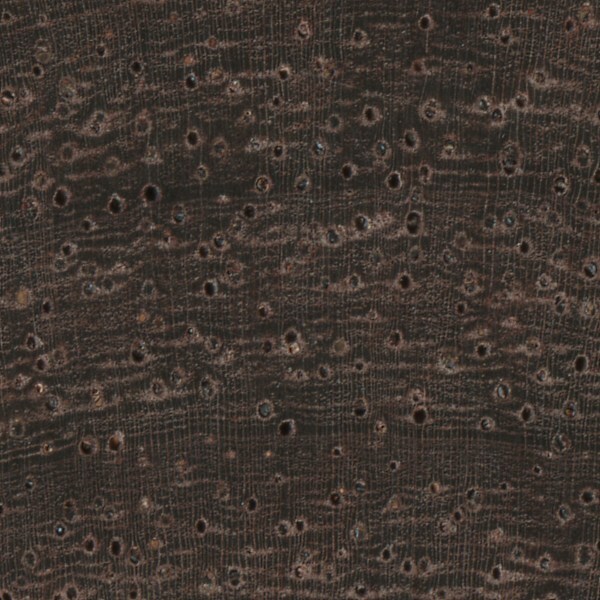 Endgrain: Diffuse-porous; large pores in no specific arrangement; solitary and radial multiples of 2-3; heartwood deposits (dark red) common; growth rings usually indistinct; rays not visible without lens; parenchyma diffuse-in-aggregates, vasicentric, aliform (winged), and banded (marginal). Heartwood extractives (violet) leachable in water. 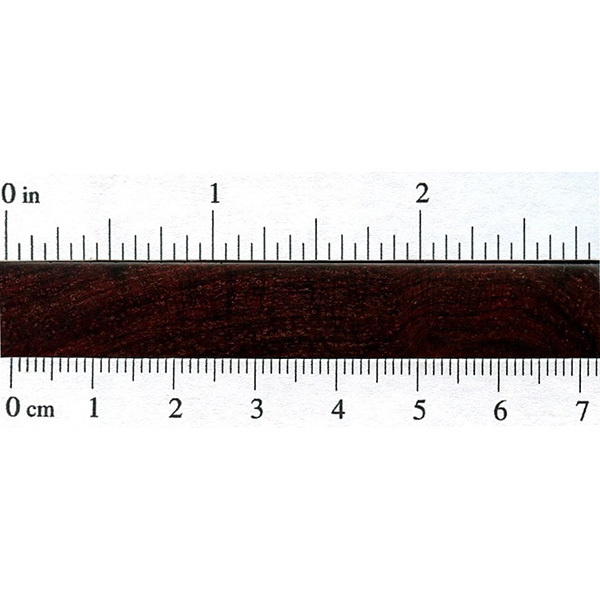 Rot Resistance: No data available; being a dense rosewood, it is presumably very durable. Workability: Bois de Rose is an excellent turning wood. Turns and finishes well, and takes a high natural polish. Odor: Has a characteristic rosewood scent while being worked. Allergies/Toxicity: Although severe reactions are quite uncommon, rosewood in the Dalbergia genus, (such as Bois de Rose), has been reported as a sensitizer. Usually most common reactions simply include eye, skin, and respiratory irritation. See the articles Wood Allergies and Toxicity and Wood Dust Safety for more information. Pricing/Availability: International trade of this species is currently (and rightfully) restricted. National parks and other protected areas within Madagascar have been plundered for their valuable rosewood logs. At present, only residual stockpiles of small turning and carving blanks are available at very high prices. Sustainability: Bois de Rose is listed on CITES appendix II under the genus-wide restriction on all Dalbergia species—which also includes finished products made of the wood. It is also listed on the IUCN Red List as endangered due to a population reduction of over 50% in the past three generations, caused by a decline in their natural range, and exploitation. Common Uses: Musical instruments, inlay, fine furniture, carving, turned objects, and other small specialty wood items. Comments: This sought-after and prized hardwood is only found on the African island of Madagascar. 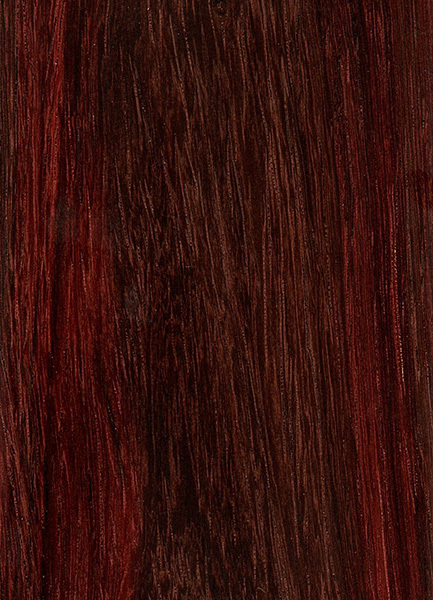 Bois de Rose is french for “rosewood,” and it is in the true rosewood genus (Dalbergia), and could rightly be referred to as Madagascar Rosewood. But to avoid confusion, the common name Madagascar Rosewood belongs to another tree species endemic to Madagascar: Dalbergia baronii. Scans/Pictures: A special thanks to Steve Earis for providing the wood sample (endgrain 10x) of this wood species. You don’t mention sapwood in this article,but this wood does indeed have a very, very, thin sapwood that is rarely seen, but it is there, it is creamy white, and often separated from heart wood with a dark black line. I had never seen this woods sapwood until I got my hands on an very old live edge piece. has more elasticity than “African Blackwood”. I am sure of it. 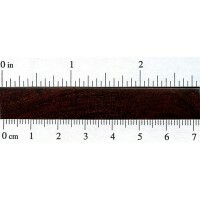 “African Blackwood” is more stiff on the other hand and far less elastic. I just worked with this species this morning. It works a lot like African blackwood – hard and somewhat brittle. The results can be beautiful. You have to “machine” it like stone or metal, more than cut it. Careful about overheating it. Burns easily. Bois de Rose is listed on CITES appendix II under the genus-wide restriction on all Dalbergia species—which also includes finished products made of the wood. It is also listed on the IUCN Red List as endangered due to a population reduction of over 50% in the past three generations, caused by a decline in their natural range, and exploitation.